Posted On July 27, 2018 by Team iCynosure. With a full-on monsoon-summer mode, I’m always looking for a good body lotion especially one with a tantalising fragrance. And for that flawless skin that's going to be on show, I’m practically looking to keep my skin hydrated and moisturised, and I found the perfect product when I chanced upon Palmer’s Cocoa Butter Formula. With Cocoa Butter extracts, Palmer’s Body Lotion smells like I’m dipped in chocolate sauce. The body lotion enriched with cocoa butter and Vitamin E claims to be fast absorbing while providing 24-hour moisture. The product also soothes dry and damaged skin, making it smooth, supple and beautiful. The texture of the lotion is creamy in pale yellow colour and initially, the fragrance is similar to that of a strong coffee which tones down to chocolate in some time. A 400 ml bottle costs INR 545 and has a shelf life of 5 years. The product is widely available on all online platforms as well as retail shops. 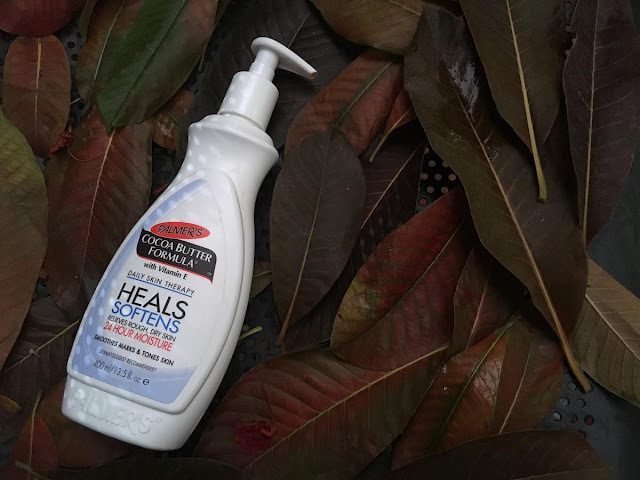 There are a number of reasons I’d recommend Palmer’s Cocoa Butter Formula with Vitamin E Body Lotion but the most relevant one would be that it instantly moisturises and hydrates tired skin making it feel healthy and supple. As it is cream based, a gentle massage ensures that the product is quickly absorbed into the skin and thus doesn’t feel heavy or greasy on the skin. Over the last month or so since I’ve started using the product I’ve noticed that the skin is more even-toned with marks and scars lightening, discolouration fading away and pigmentation being corrected. Moreover, it is an all-weather product and can be used even in the summers as it creates a protective barrier across the skin and locks in the moisture ensuring skin health. Apart from these highs the packaging and price point both work as an advantage, making Palmer’s Body Lotion a sought-after product. Have you tried Palmer’s Body Lotion, if not what are you using to keep your skin hydrated? Let me know your go-to products this summer in the comments below. I love this lotion. I have to be careful when I use it. Since my dogs want to lick it off.